:smiley29: BIG BARKER DOG BEDS :smiley29: - This Forum is brought to you by The Mastiff Sweet Spot and Friends of the Forum. IMPORTANT: If you’re considering buying a dog bed for your Mastiff (and I strongly suggest you do), please read below for a strong recommendation from me.. I have been buying dog beds for my dogs for over forty years – if there is a dog bed out there I have used it ~ or should I say my dogs have used it. Considering the number of dog beds that I have purchased over the years I should be considered a dog bed expert. Having 200 pound dogs lie on a dog bed is a definite stress test for a dog bed, and none of them have ever really impressed me until now. None of them have lasted very long – they always squash down – even the baby mattresses have not lasted. This might be because baby mattresses are not designed for 200 pound babies. Besides being compressed to a point where they were not very resilient, the covers have torn and were made cheaply. It seems that most companies are outsourcing their beds’ manufacture to other countries, resulting in cheaply made dog beds that don’t last. The expensive, specially designed “orthopedic” foam beds were not what they were advertised to be. The foam is not heavy enough for a giant breed dog. It is 7”-8” thick as advertised, but squashed right down right away, having lots of air cells with insufficient support. It seems to me that dog bed manufacturing has always been all about the money and profit, with disregard for the quality of the item produced. My dogs were still sleeping on the couch – and I have been buying a new couch every few years... very expensive. 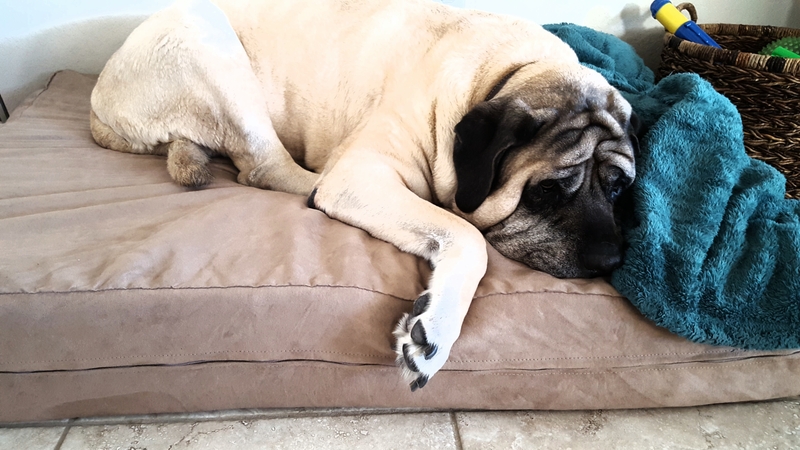 I was recently contacted by a small company named Big Barker who claimed to have the perfect dog bed for Mastiffs (and other big dogs). They asked if they should ship me a bed so I could put it through some abuse with my own dogs and let people know my thoughts. After getting my hands on the bed, my thoughts are… FINALLY! ~ a dog bed that my dogs prefer over my couch, and I understand why. I tried it out myself and the supportive comfort is unbelievable. The Big Barker Dog Bed is very well made. It has been designed to support heavy, giant breed dogs. The foam filling consists of three layers of special American made foam, sandwiched together to produce the perfect combination of comfort and support. I am not a foam expert, but I know comfort when I feel it, and so do the dogs. The difference is noticeable immediately - and the bed is guaranteed not to compress down for ten years. Ten years – WooHoo! I am going to save a ton of money buying all of those inferior dog beds, and my dogs are going to be much happier. The cover is made of really nice, strong material and very easy on the eyes. It is machine washable and does not shrink – the only negative was trying to decide which color to order it in, as it comes in several colors. Please go to http://www.bigbarker.com to read more about these dog beds and to order one. Shipping is free too, making the price of these beds very reasonable. They do cost more than the average dog bed (although not any more than the “orthopedic foam” ones) , but over the course of a year you will save a bundle in buying inferior beds that do not last, and over the course of ten years – nuff said. When you see the quality of these dog beds – made in the USA – you will be very pleased. 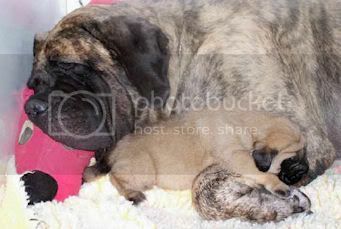 If you decide to buy one of these beds, please mention that you read about them here on the World Mastiff Forum. We have one of these beds...have had it for a few months. It has really held up so far. No dents, or crushing from 3 mastiffs taking turns sleeping on it...I would recommend these! Which size did you get for your mastiff? X-Large or Giant? I have the X-Large and it is plenty big enough. Holding up well and still everyone's favorite place to be. I just ordered one for my 19 month old brindle mastiff Kima. She somehow made a hole in her old one. The person at the dog bed place let me know that their crate pad fabric is tougher than the regular fabric so that is what I got. It was $30 more but well worth it. The beds are very reasonably priced. I did mention this forum when I ordered. Forgot, crate fabric is als water proof which is great for winters in the Pacific Northwest. So I finally caved and bought two of these. They had a "payment plan" promo going on, so I paid shipping (which, I ordered them yesterday and they were on my door step today. It was just a flat fee, so I didn't, to my knowledge, pay extra for overnight), and then will pay in two installments at 30 and 60 days out. I credited my referral to this forum. At any rate... My dogs stay in the laundry room when we're not home so I needed a slightly smaller size to fit the room. I ended up just getting the large, which is actually plenty big. My two don't really sprawl out, and if Bam-Bam does, he's going to do it on the cool floor anyhow, so they fit fine. Hey everyone, I own http://large-dog-beds.co.uk/ and know a thing or two about dog beds. I would just like to say I can recommend bigbaker beds as there are many reviews about them. If you need any other advice feel free to message me or pop on my site and ask away. Hey guys..Santa Claus time is coming. What better present than a Big Barker Bed? Our 10 1/2 yr old loves loves his Barker bed!! I'll definitely get another one for our room soon. We ordered an xl with the waterproof cover. We ended up getting two of the beds plus a crate pad. We didn't see much of Royce (our orthopedically challenged Mastiff) after we set up the first bed. Royce spent the majority of the first couple of days ensconced away in his crate lying on his new bed. We decided we needed another bed for our living room, and the pad for our van. In the process of ordering I mentioned that I'd been spurred to action by the recommendations on this forum. I had read about the product elsewhere, but had balked at ponying up the big bucks. I glad I did, this just may have been the best thing I've done for our pup.